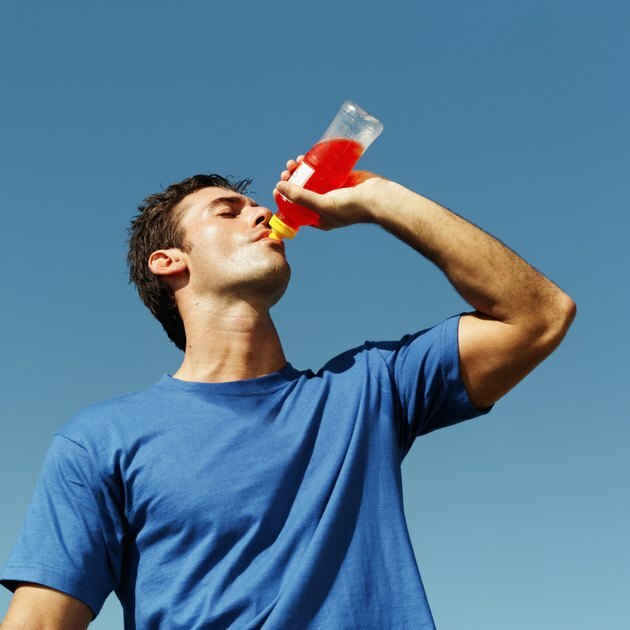 Whether you are a competitive athlete or a fitness enthusiast, or you simply prefer sweet alternatives to water, you might enjoy drinking Gatorade beverages. Gatorade, in moderation, offers a healthy option if you use it for your sports nutrition needs. However, dietary choices are especially important if you are concerned about your blood pressure -- and too much Gatorade potentially leads to high blood pressure. Gatorade products come in ready-to-drink bottles as well as powders that you mix with water. The G Series, G Series Fit and G Series Pro product lines include Prime products for before your workout, Perform products for during your workout or competition, and Recovery products for replenishing your muscles after you finish exercising. Most are not good sources of essential nutrients for regulating blood pressure, such as potassium and dietary fiber, but the high-protein recovery products are good sources of calcium, which helps maintain a healthy blood pressure. As a source of sodium, Gatorade potentially increases your blood pressure. High-sodium diets can cause high blood pressure, according to the 2010 Dietary Guidelines from the U.S. Department of Health and Human Services. Each 8-ounce serving of most Gatorade products supplies about 110 milligrams of sodium. Healthy adults should not have more than 2,300 milligrams of sodium per day. Your total sodium intake quickly adds up when you drink Gatorade instead of drinking water or other sodium-free beverages. Unintentional weight gain increases your risk for high blood pressure. Gatorade can influence weight gain because of its calories. Many Gatorade products have 50 to 90 calories per 8-ounce serving; the ready-to-drink bottles have up to four servings per container. About two-thirds of Americans are overweight or obese, and sugar-sweetened beverages, including sports drinks, are among the top sources of calories in the typical American diet, according to the 2010 Dietary Guidelines. Gatorade offers some benefits for long training sessions or competitions, since it provides carbohydrates for fuel. Gatorade also helps you maintain your electrolyte levels during periods of heavy sweating. Iowa State University suggests a beverage with 50 to 179 milligrams of sodium and 30 to 50 milligrams of potassium per cup, and many Gatorade options fall within these ranges. However, if your exercise session lasts less than an hour, water is a better option.